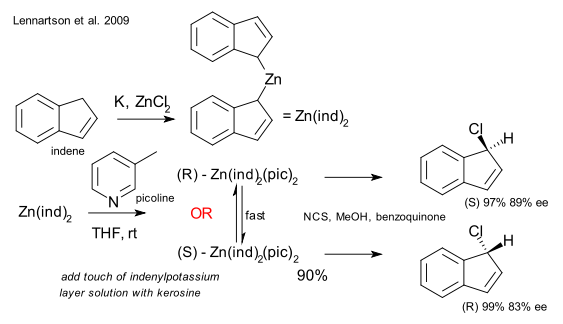 In a now classic experiment in spontaneous symmetry breaking, Kondepudy, Kaufman and Singh in 1990 crystallized the chemical sodium chlorate from solution while stirring and surprisingly ended up with chiral crystals of either handedness, that is, if one experiment yielded exclusively D-crystals, the next one would give only the L-crystals. (Kondepudy et al. 1990 DOI). Apparently one crystal form takes the upper hand in the early stages of crystallization (a random process), then proceeds to grow while eating away at the less fortunate one. This phenomenon is of some relevance to the development of homochirality as one can envision chiral synthesis taking place on the surface of chiral crystals. In the most recent contribution in this particular field, the Håkansson laboratory aims to extend the scope to regular organic synthesis (Lennartson et al. 2009 DOI) . The organozinc adduct of indene Zn(ind)2 was mixed with picoline in THF. it was then found that the Zn(ind)2(pic)2 crystals formed were again either left handed or right handed. Crushing the crystals and reacting them with NCS in methanol yielded either enantiomer of 1-chloroindene in yields up to 95%. No bias was found: 51 reactions yielded (-)-1-chloroindene and 70 reactions yielded (+)-1-chloroindene. Over in the inorganic chemistry department there is another recent development. Rao et al. added together nickel acetate, ammonium thiocyanate and the tridentate amino ligand tren and allowed the resulting octahedradral complex to crystallize from a water/methanol solution (DOI). Even more surprising: repeated experiments only yield the left-handed chiral crystal form, as evidenced by circular dichroism and any attempts to produce the right-handed crystals have thus far failed. Solutions of Ni(NCS)2tren are of course racemic but CD characteristics of either enantiomer could be obtained by adding small amounts of D or L-arabinose (exploiting the Pfeiffer effect). It can only be hoped glassware cleaning was within specs.